Peaches are in season and Toni makes them into a lovely gluten-free coffee cake. Hi, Toni Holmes here. It’s September already and one of my favorite things is the change of season. As a gluten free baker I’m always on the lookout for a great seasonal recipe. With the onset of Fall the days are milder and the mornings cooler. This means we can get back to baking in our kitchen without worry about the heat. 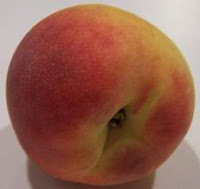 To celebrate I like to use the fruit of the season –this case fresh peaches- and bake something delicious. 1 package of gluten free yellow cake mix- I use Betty Crocker because I prefer the taste and texture. ¼ cup of vegetable oil – you can use olive oil if you have a light version. 1 ½ cups peeled and chopped fresh peaches – if you choose canned-drain and pat dry. You can also substitute the natural canned juice-if not sweetened- for the ¼ cup water. 1. Preheat oven to 350 degrees F (175 degrees C). Grease and flour a 10-inch fluted tube pan (such as Bundt®). 2. Mix cake mix and brown sugar together in a bowl; add yogurt, applesauce, water, vegetable oil, eggs, maple flavoring, and cinnamon. Beat on low speed with an electric hand mixer until blended. Scrape bowl and beat on medium speed for 4 more minutes. 3. Toss peaches with enough cinnamon and fold into the batter. Pour batter into the prepared pan. 4. Bake in the preheated oven until a toothpick inserted in the center of the cake comes out clean, 55 to 60 minutes. Let cool in pan for 10 minutes, then turn out onto a wire rack to cool completely. Dust with confectioners' sugar. Maple with peaches. I hadn't thought about that. Hmm. Thanks for a new flavor combination! I need to make this, my daughter is gluten free and this sounds perfect. Sure sounds good, thanks for the recipe!